Did I mention I hate mosquitos? 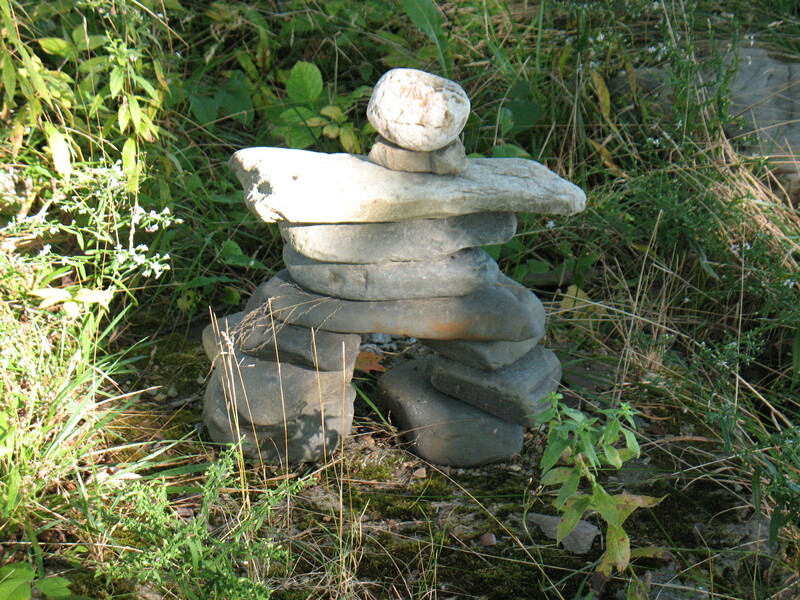 Inukshuk on the path to the our lake. When we moved to Maine, I had a few concerns outside of leaving family and friends and my comfort zone in California. The winters, of course, made me a bit nervous. Would we get snowed in, would I get cabin fever, could I handle being outside with temperatures below freezing for 3-4 months a year? No, no, and yes I could handle the cold and even found a lot of ways to enjoy the beauty that is Maine in the winter. The mosquitos of late spring and summer are another matter altogether. I knew that the little insects were ubiquitous, but I figured they could be controlled. And they can, if you want to while away the best time of the year indoors. Repellents, coils, candles, and machines just provide a false sense of security. Mosquitos can locate whatever small part of your skin that is unprotected, zero in on it and leave a welt that not only itches but is unattractive to boot. I refuse to let them force me into long pants and sleeves. So I’ll continue to spray up and keep my After Bite pen close at hand. This entry was tagged mosquitos, summer. Bookmark the permalink.